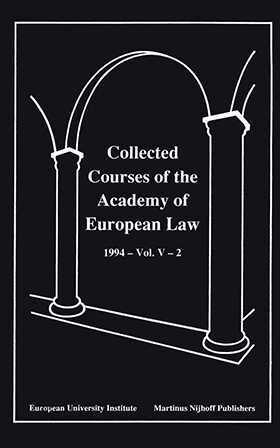 The Academy of European Law was established by the European University Institute in 1990 and extends the Institute's current programmes into a larger field of interest. It has as its main activity the holding of annual Summer Courses in the law of the European Community and the protection of human rights in Europe. In addition to General Courses, shorter courses are held on subjects of special academic and practical interest in both fields. Finally, special guest lectures on topical issues are given by policy makers, judges and persons who have held or currently hold the highest position in these fields. The courses are published in the language in which they were delivered (English and French).